Home » Blog » Awareness » How to reflect? Self-assessment is related to the first part of the theoretical framework of HumanBusiness, which is self-awareness. Being able to reflect on our actions, our thinking and our beliefs through self-assessment creates awareness. Through self-assessment we are able to consciously understand what we do, how we think and eventually find out why we perceive the world through a specific perspective. Through deep thought and consideration, which is how reflecting is defined, it is possible to become more aware of ourselves. We can reflect back on past actions, thought patterns or beliefs to identify our own motivation and the effect on other people. Once we are aware of ourselves, we have laid the foundation for making a change by comparing our own behaviors to the ones which we encountered in form of possibilities we became aware of in our environment. This emphasizes that reflection can only be seen in combination with learning. The starting point for reflection is most likely the event which took place, for example what action we have taken or more likely the one we have not taken. Something about how we feel during or after the event is bothering us. That is why we keep thinking about it and our mind wanders back to it. Give these thoughts some room to develop. Only then we can access its origin and solve it eventually. 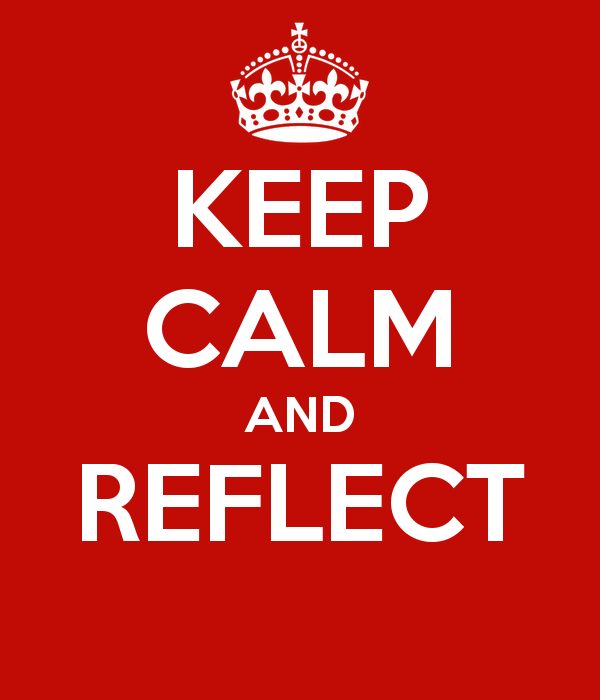 We can channel the process of reflection by applying the following practices. We all know the one time of the year were we make these big resolutions of what we want to change – New Year’s Eve. However, we also know that these intentions most often do not last long. This can be very frustrating. It does not have to be that way though! We as humans are naturally skeptical against change. Why do we want to rush ourselves into major changes at a specific date then? We could be off to a longer lasting and more successful way by taking small steps towards change. Even though New Year’s Eve is a good time to reflect on our performance during the last year, it is more important to reflect on a monthly, weekly or even daily basis. When we reflect right after an event has taken place our memories are still fresh. Nevertheless, it can also be helpful to put some distance in form of time between the event and our reflection. This could make us see things from a different perspective. Anyway, reflection should be part of our daily routine or at least take place repeatedly, which means more than once a year. How can we insert yet another tool in our busy schedule with all the priorities which need our focus? Well, we could for instance use the time we have more efficiently. That could mean that we reflect while we are in the shower, commuting to or from work or when we are in bed ready to enter dreamland. And maybe we will find out through reflection that some of our priorities are actually not as important as we thought. By focusing on our top priorities we could make more time available for the really important things in our lives. In his TEDx talk Rory Vaden even introduces another technique on how to multiply our time as he suggests that we should do what is significant to us first. The best environment for reflection is to be only with our self. In this place of solitude we should avoid any disturbances so that we can focus. That could mean to put on our headphones in the train while commuting or to turn off the TV when at home. We need to get comfortable with being alone with our minds so that we can listen to our thoughts. Listening can however only take place, when we are quiet. In order to make our mind wander we need to be still. When we are calm and relaxed we will be able to have the deepest thoughts and could come to surprising inspirations. A stress-free environment looks different for everyone. But we can consciously prepare ourselves for getting ready to reflect. Making ourselves a nice cup of tea, breathing mindful, sitting down or doing whatever calms us down and makes us present so that we can focus. It can help to write down our thoughts to give them more structure. Another benefit is that we can access them again later on. This could be used to compare past and present behaviors so that patterns are recognized. It could also visualize a shift, which hopefully results in progress into the desired direction. Another way to reflect is to talk to a person who we feel comfortable sharing your thoughts with, like a close friend or mentor. This might provide us with a different perspective. Sometimes thoughts just have to be spoken out loud so that we could see a new angle. The most important aspect is to be honest with our reflections. We should look deeply for the real cause. Only if we get to the root of our motivation we will be able to change it in a long-term perspective. Of course we can tell ourselves an excuse or apply some short-term fixes, which will probably make us happy for a while, but it does not sustainably solve the issue. And on top of it, why would we lie to ourselves? What did we do? Starting with reflecting on our actions seems to be obvious, because we can simply see our own behavior and remember it by putting it back in front of our eyes. This will visualize what we have done or have not done. We can ask ourselves what we did in a specific situation. It can also be useful to reflect about what effect our action had on other people and if the result is satisfying (most importantly to us, but also for the affected others). What were we thinking? Reflecting on our thinking lets us realize our thought patterns. The first aspect we should to ask ourselves is how we came to the conclusion that our chosen reaction was the right response to that situation. Right means that we feel comfortable with our action and can explain it to others. This brings us to the second aspect we should reflect upon, which is how we feel with having taken an action. Related to this is also how our action makes other people feel. Again we can ask ourselves is that the desired outcome we wanted to achieve? Why did we do it? Reflecting on our beliefs will clarify the motivation for our action. The third question we should ask is why have we taken this specific action? What was our motivation to react to the situation like we did? If we have truly answered these three questions of what happened, how we thought and felt and why we have done it, we are able to answer if that action was the right response for us. If we believe with our current perception of the world that this was the right reaction for us, we cannot blame ourselves or be blamed. We simply did not know better. However, since our perception is limited it makes sense to get another perspective on our action. This is possible through talking to a family member, friend or mentor. Here, the importance of diversity needs to be highlighted, because different perspectives are most likely be provided by persons who come from other environments than us. Through reflection it is possible to find out if the action we have taken in a specific situation differs from the action we believe to be right. The beliefs we have on how we see the world is largely influenced by the possibilities we have encountered in form of inspirations, tools and maps. Through lifelong learning we can get aware of how others are handling similar situations. By comparing our own actions, thoughts and beliefs to the ones of our environment we can get a sense of what an appropriate action would look like and apply it the next time. If we believe that the action we have taken was not the most appropriate, based on our reflection and from receiving other perspectives, we need to think about what would have been a more appropriate action. In order to find an answer to that, the order of the questions needs to be reversed. This means, we need to start with our motivation and believes, the why we want to react in a different way. Probably we have already an answer to that, because we are not happy with the current outcome otherwise we would not be thinking so much about how we reacted. In my opinion the most critically aspect to consider is how we want to feel with a decision. Is the action we want to take the next time in line with our values? How do we want to make others feel with our actions? It is perfectly fine to place our needs above the needs of others. Remember, however, that we are living in an interdependent society where it matters how we treat others. After we have answered these questions, we will be able to sense what the right thing to do will be. This is based on the fact that our motivation and values have funneled our opportunities into an appropriate action. What are your experiences with reflection? How do you reflect? ← How to never stop learning?